Heat oven to 350°F. Line large cookie sheet with foil; spray with Crisco® Original No-Stick Cooking Spray. In 12-inch nonstick skillet, cook pork 5 minutes over medium-high heat, stirring frequently. Add onion, bell pepper, 1/2 teaspoon salt and 1/4 teaspoon pepper. Cook 4 minutes longer, stirring occasionally, or until pork is thoroughly cooked and vegetables are tender; drain. Reduce heat to medium-low. Stir in 1/4 cup of the jerk sauce, 3/4 cup of the cilantro and 1/4 cup of the marmalade, cook 5 minutes longer. Cool 5 minutes. Meanwhile, unroll dough on cookie sheet; press into 16x14-inch rectangle. 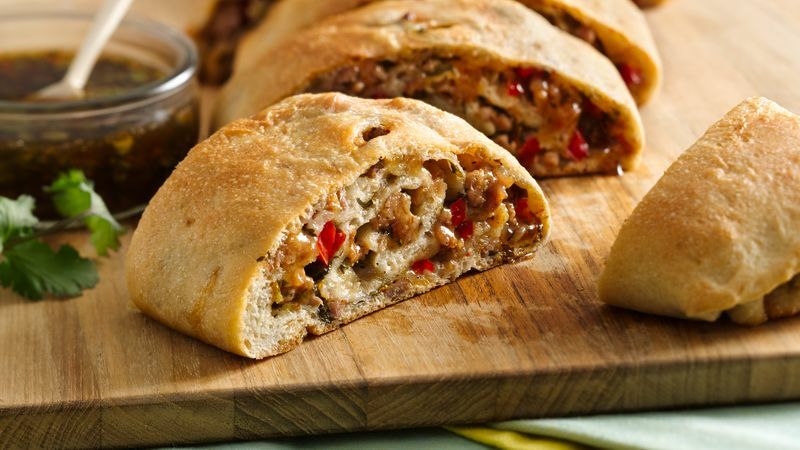 Spread meat mixture over dough to within 1/2 inch of edges. Starting on short side, roll up; pinch edge and ends to seal. Carefully turn roll seam side down on cookie sheet. With sharp knife, cut several small slits in top of roll. Bake 25 to 35 minutes or until light golden brown. Let stand 10 minutes. Meanwhile, in 1-quart saucepan, mix remaining 1/4 cup jerk sauce, 1/4 cup cilantro and 1/4 cup marmalade; cook on low heat 3 to 5 minutes or until warm. Cut roll crosswise into 8 pieces. Drizzle each piece with jerk marmalade sauce. Garnish with additional cilantro, if desired.